THIS MIGHT BE HARD TO BELIEVE—it was for me—but the Japanese government’s financial assistance for historical preservation is rather limited. Only 10 local governments are covered under a 1966 law that restricts urban development near historical areas. Two of them, not surprisingly, are Kyoto and Nara. There is also very little financial assistance from the national government for ensuring the survival of historical buildings through restoration and repair. As an illustration, there were 10,900 such buildings in the central part of Kanazawa, Ishikawa, in 1999, but that number had fallen to 8,700 by 2007. This state of affairs now seems likely to change, as the Ministry of Land, Infrastructure, and Transport has formulated a plan for providing financial subsidies to local governments to promote urban development that takes historical scenery into account. The ministry, the Agency for Cultural Affairs, and other government bodies will submit a bill incorporating this plan to the Diet during the current session. According to news reports, the bill would permit local governments to apply for financial assistance for urban development plans that incorporate the preservation of scenic areas, subject to the approval of the national authorities. The government would provide from one-third to one-half of the expenses for restoring, repairing, or moving historical buildings, and for supporting traditional activities, such as festivals. Two cities that stand to benefit from the legislation include the aforementioned Kanazawa and Hagi, Yamaguchi. Kanazawa is noted for Kenroku-en, a famous garden that has its own website, and a castle district with old homes. Meanwhile, see this page for an explanation of the attractions of Hagi, which include the homes of samurai and tradesmen dating from the Edo period. In fact, some of Hagi’s attractions can be seen in the accompanying photo. Yes, they’re models, and yes, they made sure to scrub the location well before taking the picture, but I’d rather lean against a wall in that neighborhood than go to a shopping mall any day! OZAWA ICHIRO, the president of the Democratic Party of Japan, the country’s leading opposition party, is considering a trip to South Korea to visit Lee Myung-bak on 22 or 23 February, just before Mr. Lee’s inauguration as president, according this Kyodo report. Prime Minister Fukuda Yasuo also might drop in on Mr. Lee, but he would visit around the time of the inauguration itself. The Japan Times eagerly suggests in its headline that Mr. Ozawa might upstage the prime minister by being the first to visit Mr. Lee. (The newspaper’s political orientation is such that they would be delighted if that happened.) Upstaging Mr. Fukuda might well be the DPJ president’s reason for making the visit, but the way Mr. Ozawa and the party behaved when he visited China in early December suggests another possible outcome: the visit could blow up in their faces like an exploding cigar. Mr. Ozawa’s mentor was the late Tanaka Kakuei, the Boss Tweed of Japanese politics. Mr. Tanaka took a special interest in China, and this interest is shared by his protégé. The DPJ president regularly leads groups on goodwill tours of the country. During his tour last December, the group met with Chinese President Hu Jintao. Here’s the BBC report on his visit; the headline reads, “Ozawa beats Fukuda to China visit”, as if the article belonged in the sports section rather than the Asian news category. This story begins when the Dalai Lama visited Japan last November on a tour to raise the awareness of the Chinese oppression of his Tibetan homeland. DPJ Secretary-General Hatoyama Yukio held a joint press conference with him during his stay here. “We express our great surprise and strong dissatisfaction with Secretary-General Hatoyama’s statement of support for the Dalai Lama at the press conference. “Under the guise of religion, the Dalai Lama is an anti-Chinese political exile working to break up the country. “Ozawa Ichiro, the president of your party, will lead a large delegation to visit our country early next month. As it happened, Uyghur human rights activist Rebiya Kadeer, who had spent six years in a Chinese jail, and who was forced to divorce her activist husband by the Chinese government, was also in Japan at the time. She had been invited to attend a study conference organized by Makino Seishu, one of the DPJ’s founding members with Kan Naoto and Hatoyama Yukio. A former lower house member, Makino has for years been an outspoken advocate for the Tibetans and the Uyghurs, and of democracy in Asia. 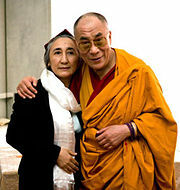 Ms. Kadeer (shown in the second photo with the Dalai Lama) soon found herself disinvited by the conference. A room for the meeting had been reserved since August in a building used by Diet members, but the party applied some pressure to Mr. Makino to avoid offending the Chinese. She did wind up addressing a study conference, but it was not one with direct DPJ involvement. That get-together was sponsored by three LDP members of the Diet instead: Nakagawa Shoichi, Eto Seiichi, and Hiranuma Takeo. Those who attended heard about the Chinese imprisonment and execution of Uyghurs and their justification of their behavior by insisting it is part of the global war on terrorism. Mr. Hatoyama admitted the letter had been delivered to the party, and that party leaders thought it best for the conference to be held at a different location. And so Mr. Ozawa’s Beijing junket remained on the schedule. He did miss a few days of the special Diet session extended to discuss the new bill for Japanese support of NATO’s mission in Afghanistan, but the DPJ boss is not one to let legislative affairs interfere with his other interests. Alas, Mr. Ozawa didn’t do himself any favors in Japan with his behavior. The DPJ leader can be arrogant at times, particularly when he thinks he has the upper hand in a situation. Indeed, The Economist of Great Britain has in the past referred to him as a bully. But his behavior when he met with President Hu bordered on fawning obsequiousness, according to several sources quoted in the 20 December edition of the weekly magazine, Shukan Shincho. Photographs of the meeting show the often haughty Japanese politician beaming and sitting up straight in his chair like a child anticipating a special treat. Reports suggest that in contrast to his normally calm and deliberate speaking style, Mr. Ozawa’s voice was high-pitched and squeaky, even quivering at times, as he spoke to President Hu. Instead of the standard bland diplomatic boilerplate, he offered President Hu thanks that came across to some as unctuous toadying. Two of the magazine’s sources were members of his own party, and they were not shy about speaking on the record. Watanabe Hideo said he found the whole scene too embarrassing to watch, and added that everyone in the traveling party should be ashamed of themselves. Oe Yasuhiro described Mr. Ozawa as behaving as if he were pledging fealty to a feudal lord in an old-fashioned tributary relationship. Mr. Watanabe recalled that Mr. Ozawa had once given a press conference in which the DPJ president claimed that Japan was too biased toward the US and too fawning toward China. He quoted Mr. Ozawa as saying, “I will say what should be said to both China and the US.” He also remembered that Mr. Ozawa once criticized two-track diplomacy by saying that the conduct of foreign relations is the exclusive right of the government. It should be noted that both Mr. Watanabe and Mr. Oe were members of Mr. Ozawa’s now defunct Liberal Party. That generally conservative grouping was part of the Liberal Democratic Party’s ruling coalition during the Obuchi Keizo administration. When other LDP members blocked Mr. Ozawa’s readmission to the party (to which he belonged for almost 30 years), he converted that into an opportunity to cross the aisle and join the opposition DPJ. The two men are now among Mr. Ozawa’s harshest critics, perhaps because the latter seems to have blithely jettisoned his former political beliefs after becoming the leader of the generally more left-of-center DPJ. Also criticizing Mr. Ozawa was the staunchly anti-communist Chinese-born journalist and critic, Shi Ping (third photo). 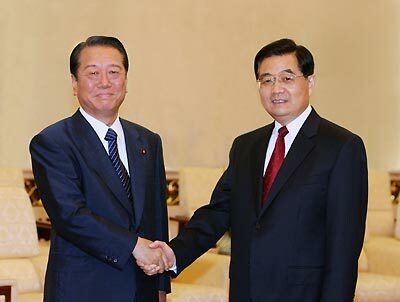 Mr. Shi (who recently took Japanese citizenship) observed that the Ozawa-Hu meeting was given front-page coverage in the People’s Daily the next day. The article quoted Mr. Ozawa as using language that was both fulsome and excessively flowery to thank Hu for meeting him. In Japanese, his words were rendered this way. Mr. Shi characterized the Japanese visitor’s attitude as that of a Ginza hostess trying to curry favor with her customers. He thought that Mr. Ozawa’s approach was tantamount to positioning Japan as a Chinese vassal state, and that the description used by the People’s Daily was identical to those the paper prints when provincial Chinese government officials go to the capital to call on President Hu. He also wondered how Mr. Ozawa could claim to represent the entire Japanese people, much less describe them as being deeply moved. The account of the Ozawa-Hu meeting is noted with little more than a photograph in the English edition of the People’s Daily. Here is the Japanese version, which uses language more restrained than that described in the magazine interview. Mr. Shi, however, is talking about the Chinese-language version of the article, and the People’s Daily is known to change versions of their coverage depending on the language of the edition. Is Seoul Next on the Travel Agenda? But now Mr. Ozawa wants to visit South Korea in advance of Prime Minister Fukuda’s visit. What will he and the future South Korean president talk about? The Kyodo article suggests one topic—Mr. Ozawa’s recommendation last week that voting rights be extended to Korean citizens resident in Japan for local elections. These Koreans citizens are the descendents of those ethnic Koreans who were either brought to Japan or came voluntarily to work. In fact, what Mr. Ozawa actually said earlier this week was that he has favored for some time extending the right to vote in local elections to people with permanent resident permits, and that his party would introduce such legislation in the Diet later this session. The ethnic Koreans who would receive the right to vote are estimated to total about 600,000, while the figure for all foreigners with permanent resident permits, ethnic Koreans included, number about 950,000. 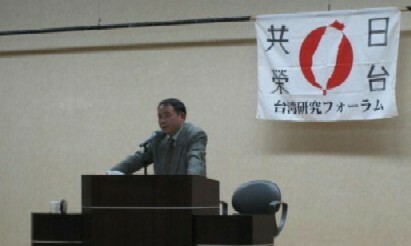 His suggestion was immediately seconded by the leader of the New Komeito Party, Ota Akihiro. This was significant because New Komeito is the junior coalition partner of the governing LDP. There has been speculation that Mr. Ozawa hopes to pry New Komeito loose from its ties with the LDP and entice them into a new governing coalition with the opposition parties. New Komeito is the political arm of the lay Buddhist group, Soka Gakkai. A large number of their membership is thought to be ethnically Korean. Japan’s citizenship laws are based on the legal concept of ius sanguinis, or nationality on the basis of family origin. This contrasts with the legal concept of ius soli, or nationality on the basis of the place of birth. In other words, the ethnic Koreans who were born and grew up in Japan, speak only Japanese, and often have never set foot on the Korean Peninsula, do not have local voting rights unless they become naturalized Japanese citizens. Should Ethnic Koreans Have Japanese Voting Rights? It is not the business of foreigners to recommend to the people of another country with a democratic system to whom they should or should not extend the right to vote. That includes me, who, as the holder of a permanent resident permit in Japan, would gain the right to vote if the proposed legislation were submitted and passed. But to briefly summarize the pros and cons, those in favor would say that most of the ethnic Koreans born in Japan are virtually indistinguishable from a native-born Japanese with the exception of their passport. Those opposed, however, would assert that citizenship choice is in very real terms a pledge of allegiance. Though Japanese citizenship is relatively easy for ethnic Koreans born here to obtain, those who choose not to do so are pledging their allegiance to another country. In some cases, that country is, de facto but not de jure, North Korea rather than South Korea. Why should people who make that choice be able to vote in Japanese elections? The Japanese public is of course aware of how easy it is for ethnic Koreans to obtain Japanese citizenship, so Mr. Ozawa deliberately tried to soften the impact of his proposal by including all permanent visa holders rather than specifying Koreans. Doing so would have the drawback of enfranchising some people with a deficient working knowledge of the Japanese language. But why is this the business of future Korean President Lee Myung-bak, and why should Mr. Ozawa feel the need to discuss this issue him? Does he intend to fawn before the South Koreans too? Does he seriously think this will earn him goodwill from the new government in Seoul? Or is he simply running in a pointless one-man race to meet Mr. Lee before Prime Minister Fukuda does? 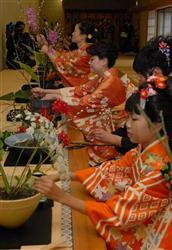 Many foreigners urge Japan to improve its relations with China and South Korea. The unspoken premise of their urgings is that the Japanese are somehow to blame for the state of the respective bilateral relationships not being as good as it could be. It is as if the Chinese and the Koreans were anxiously pining for Japanese friendship with open arms, while the Japanese are unable to respond because they cannot overcome some obsolete notion of tribal superiority. If anything, the reverse is true. Both China and South Korea have partly defined their contemporary identity by demonizing Japan for its past behavior; China continues this policy even as Japanese generosity underwrites to a significant degree China’s economic growth. And if anyone in the region cannot overcome the obsolete notions of the past, it is the Koreans. Some members of their government and media seem to encourage anti-Japanese attitudes out of a spiteful desire to indulge the uniquely Korean sense of han, or grudges over past wrongs. There is very little positive to be said about today’s China, other than the fact that some Chinese know how to make a lot of money. They are manipulated by a brutal, oppressive regime contemptuous of the concept of human rights. Those who have eyes cannot fail to see that the Chinese are intent on reestablishing their ancient hegemony in the region in an East Asian version of manifest destiny. Meanwhile, North Korea has turned itself into the political equivalent of a suicidal religious cult. If any politicians or diplomats in the region need to adapt to contemporary political realities, it is those of China and the Korean peninsula. They are the ones who need to readjust their behavior and attitudes toward Japan, whose actions—unlike theirs—have been exemplary for the past sixty years. To assert otherwise is to view the world through the wrong end of the telescope. To suggest that the Japanese need to change their outlook and behavior toward their neighbors is to suggest that the Japanese need to conduct a regional foreign policy based on appeasement. Such a suggestion cannot have been made by clear-headed observers. Is it the case that Ozawa Ichiro has fallen under the spell of appeasement? Why else would his party placate the Chinese after their leaders had the effrontery to talk to the Dalai Lama or a representative of the Uyghurs? Why else would Mr. Ozawa behave in front of the new Chinese emperor like a pupil being given a gold star at a student assembly? Why else would he travel to Seoul to discuss the voting rights of Korean nationals in Japanese elections? Events over the past six months have demonstrated that it is not as likely as it once seemed that Mr. Ozawa will become Japan’s prime minister–or that if he does, his term in office will not be appreciably longer than that of, say, Abe Shinzo, without Mr. Abe’s unheralded accomplishments. But if he does become prime minister, the reports of his recent behavior in China and the justification for his possible visit to South Korea do not bode well for Japanese foreign policy under an Ozawa administration. SOMETIMES, A FIREFIGHTER JUST ISN’T AROUND when you need one. 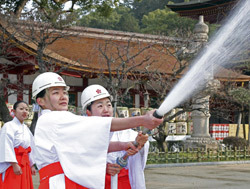 The folks at the Dazaifu Tenmangu, a Shinto shrine in Dazaifu, Fukuoka, hope they never need to call the fire department. The main sanctuary has been designated an important national cultural treasure. The shrine is also the repository of many documents, art, and crafts dating from the Heian period to the Edo period (which covers 1100 years). That’s why every year around 26 January, the shrine priests and miko, or shrine maidens (roughly equivalent to altar boys at a Catholic church) hold fire drills on the Fire Protection for Cultural Properties Day. The original of this shrine dates back to 919, when it was built at the imperial command in dedication to the spirit of Sugawara no Michizane. (Read more about him from a previous post here.) He became the patron of calligraphy and scholarship, and to this day students preparing for entrance examinations make a pilgrimage here to pray for success in their tests. The present building was constructed in 1591. It’s a good thing they don’t have any of my old examination papers among those documents they have stored. I’d be tempted to let them burn! ALL SHINTO SHRINES have an enshrined deity, and most have more than one. The spirit of the deity can be almost anything; it is often that of a person, but it can also be a natural object, such as a tree. There is a Shinto shrine about a 20-minute drive from my house where people go to worship a phallic-shaped rock (particularly if they want children). The enshrined deity in the Suwa Shinto shrine in Hamatama-cho, Karatsu, a small city on the Sea of Japan in Saga, is a falcon. Late last November, the shrine held an annual event in which falconers fly several types of falcons as an offering to the deity. 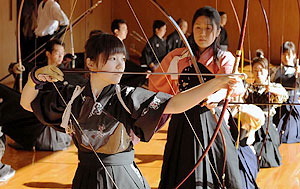 Shown in the photo is 13-year-old Ishibashi Misato of Takeo, the youngest female falconer in Kyushu. The story goes that falconers first came to the shrine about 1500 years ago from the Korean Peninsula. 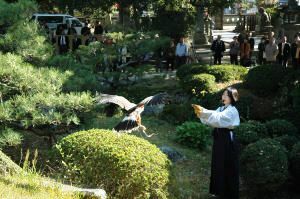 The event during which the flights occur is part of the shrine’s fall festival, and since last year, they have asked the World Falconers’ Club of Kyushu to participate. Miss Ishibashi is shown flying a Harris hawk, which has a wingspread of about one meter. She lets the hawk fly freely, but it will return to the glove on her left hand when she blows a whistle. For some people, the image of Japan is a land of Hello Kitty, robots, cartoons and comic books, and otaku who spend too much time alone in their rooms. From my perspective, however, this story and all its constituent elements are just as much a part of modern Japanese life as anything mentioned in the previous sentence. And it’s just one small event in one small town in one corner of the country. Multiply this by several million more stories, each just as unique its own way, and the real picture starts to emerge. HERE’S A STORY that flew under everyone’s radar—in the English-language media, anyway. That wasn’t the case in Japan, where it’s all over the Web. American congressman Mike Honda—perhaps Japan’s least favorite son after he pushed the comfort woman resolution through the U.S. House last year—jetted into Japan earlier this month. Did he come to see the Tokyo Tower, the temples in Kyoto, or the first sumo tournament? He might have done all that, but he didn’t release his schedule to the media while he was here. The one stop that did become public knowledge, however, caused more than a few eyebrows to rise. Mr. Honda paid a courtesy call on Eda Satsuki (photo) of the opposition Democratic Party of Japan, a former socialist who was elected last year as the president (presiding officer) of the Diet’s upper house. The weekly magazine Shukan Shincho reports the two men met at about 5:30 p.m. on the evening of 8 January. Also present were two other upper house members from the DPJ and two from the Communist Party of Japan. The magazine quotes a participant as saying the two chatted pleasantly in English for roughly 15 minutes (Mr. Eda has a law degree from Oxford) about the comfort woman issue and Japan’s death penalty, with no sign of acrimony. Mr. Eda also explained some of the artwork in the room. Why would the two meet? The magazine offers the comment of an unnamed reporter who points out that the DPJ has submitted a “Bill Promoting the Resolution of the Comfort Woman Problem” to the Diet seven times since 2007. The legislation would provide for a formal apology and compensation from the government. The bill has had six sponsors, one of whom is Mr. Eda. Mr. Eda’s office explained that some Diet members and people associated with NGOs asked the upper house president at yearend to take the time to meet with the American lawmaker. 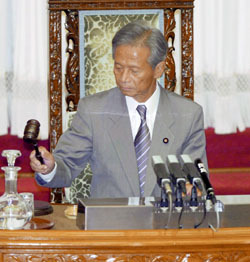 The upper house president himself offered the bland platitude that he agreed to see Mr. Honda because he thinks it is important to hear a wide range of opinions on different issues. Considering the approach of the weekly newsmag medium and Shukan Shincho’s tilt to the political right, it was no surprise to see the publication indulge in some lurid speculation. They think Mr. Honda is in the pocket of the Chinese and quote a Washington correspondent speculating that he came to Japan to dig up some more dirt on the Nanjing Massacre and Unit 731, the notorious biological warfare research team. Naturally, said the reporter, meeting an influential Japanese politician would be good PR. The article concluded by expressing the wish that Mr. Eda had taken the opportunity to raise some objections with Mr. Honda about his behavior, rather than having a pleasant chat. The strident, second-rate prose notwithstanding, Shukan Shincho does make a valid point. The perquisites of Mr. Eda’s job as upper house president include an official residence, a salary 1.7 times that of an ordinary upper house member, and the probable receipt on retirement of a medal in the grand cordon rank. A man in such an important and visible position might have been more discreet about meeting someone as controversial in Japan as Mike Honda, even if they are ideological soulmates. A private conversation with no cameras allowed would have been easy to arrange. On the other hand, if Mr. Eda is such a strong proponent of compensation for the comfort women, why shouldn’t he display the courage of his convictions and discuss his views more openly? Indeed, why not appear before the cameras in Japan with Mr. Honda to make his case to the Japanese public? If the issue means that much to him—and evidently it does—he should be willing to take the political and electoral heat for his beliefs. The last thing he should do is pretend it’s no big deal—when it so obviously is. SOME CHRISTIAN CHURCHES—following a Hebrew custom–insist on baptism with full body immersion for purification. This has an intriguing parallel with Shinto, as shown by the Hadaka Matsuri (Naked Festival) of the Yasaka Shinto shrine in Kumamoto, which was held on the 20th. 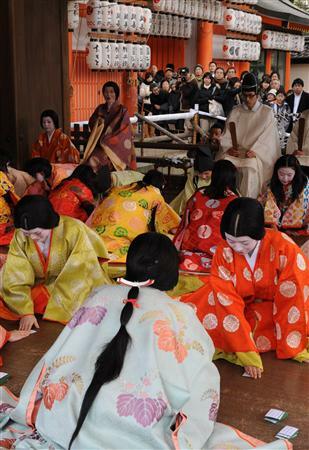 A group of men change into loincloths to perform a misogi, or ritual ablution, in imitation of the monks who did the same 400 years ago during a time of plague in the area. 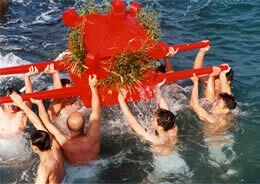 “The Hadaka Matsuri (Naked Festival) was held today in Amakusa-gun, Reihoku-machi, during which area residents carried a mikoshi (portable Shinto shrine holding the divinity) into the sea in supplication for health and safety. “The Hadaka Matsuri of Yasaka Jinja (Shinto shrine) in Kotsufukae, Amakusa-gun, Reihoku-machi, is said to have begun about 400 years ago when people in the area were suffering from a virulent disease. Seeking relief through divine intervention, itinerant mountain priests plunged into the cold sea in an act of religious austerity. 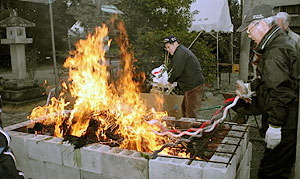 “After a Shinto rite was conducted around a bonfire at 10:00 a.m., a group of 30 men ranging in age from 24 to 62 and wearing bleached cotton loincloths carried the mikoshi outside the shrine grounds and entered the frigid waters. “It was unfortuately rainy this morning in the Amakusa area, but the men, whose skin turned red in the cold rain, offered prayers for the health and safety of local residents as they swam about 200 meters, buffeted by the waves. Many spectators provided moral support. Additional information: The itinerant mountain priests, or yamabushi in Japanese, were known to carry conch shell trumpets (for reasons I don’t understand), and that’s why one of the men can be seen blowing one in the film clip. The phrase they are chanting for self-encouragement is “Yoiya, yoiya!” Also, during their visits to local homes after coming out of the sea, they enter without removing or changing their footwear, normally a serious breach of etiquette in Japan. Legend has it that the householders are supposed to give their home a thorough cleaning by sundown. In Christianity, baptism is a rite of purification that represents an initiation. The parishioners of the Yasaka shrine aren’t being initiated—but they are recreating an event in which their ancestors were saved. It’s seaweed season in Japan! LIKE CHOW MEIN AND PIZZA PIE, sushi has transcended its place of origin to become another mealtime option for people in many parts of the world. For example, there’s a large cafeteria in New York City across the street from Grand Central Station offering a selection of ready-to-eat food so varied it would please even the pickiest of American palates. One corner of the establishment is occupied by a Korean merchant doing a brisk business selling sushi. There’s the ironclad proof: the Japanese dish is now as American as a cheese enchilada, kielbasa, or sauerkraut. There are several ways to prepare sushi, and one of the most common is called makizushi, in which the rice and other ingredients are rolled into a cylindrical shape kept intact by paper-like sheets of processed seaweed. The word in English for the type of seaweed used is laver, but since that’s unfamiliar to nearly every native speaker, most translated material uses the Japanese word nori. Everybody knows how food is grown even if they’ve never been on a farm, so it’s easy to picture in the mind’s eye what it would be like to raise an unfamiliar Japanese vegetable, such as the goya from Okinawa. But it’s unlikely people outside of Japan have given much thought to how the nori that holds the makizushi together is grown and processed. 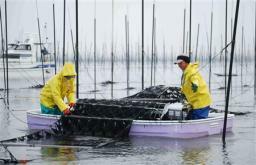 For a start, look at the accompanying photo showing watermen in the Ariake Sea in Kyushu harvesting seaweed last month. Though they’re dealing with a green plant, Japan considers this business to be part of the maritime industry rather than the agricultural industry. And an industry it is: the country produces more than 340,000 tons of nori a year, worth more than a billion US dollars, in more than 600 square kilometers (230 square miles) of coastal waters. The area with the highest production volume and the highest quality product is the same Ariake Sea shown in the photo. It’s a profitable business, but those watermen earn every yen. The growing season starts in the fall and lasts throughout the winter, so they’re out on the water in boats working during the coldest part of the year. They’re also working in the water—the area shown in that photograph is no more than chest deep. Seaweed spores are placed on nets, which are fastened to poles sunk into the seabed. The nets are suspended vertically in the Ariake Sea, but in other areas of Japan they are laid out horizontal to the water’s surface. The first crop is harvested after about six weeks, and subsequent harvests can be taken from the same initial seeding in 10-day intervals. The watermen will work nearly round the clock for three or four months straight. Those two men left before dawn in fishing boats from a small port in Kawasoe-machi to the beds about eight kilometers offshore. They don’t own the beds—they rent the space instead, and the sections they use are determined by lottery every year. After their arrival, they transferred to those work boats to haul in the seaweed. A few hours later, when the boat is full, they’ll take the crop back to shore for processing and then head out again. Most watermen will make two or three round trips during the course of a day. The freshly harvested seaweed is taken to be processed, and many watermen and their families also handle that part of the job in large sheds built on their property. They use a pitchfork to shovel the raw seaweed into a hopper at one end of a series of machines that will clean, chop, press, dry, bake, and fold the nori in operations that take roughly two hours from start to finish. This results in folded bundles that are inspected and placed in a large wooden box for delivery to the local cooperative, which is responsible for the packaging and distribution. This year, warmer temperatures in Kyushu delayed the initial placing of the spores, resulting in the latest first harvest in 40 years. The watermen waited because colder water produces nori that is both softer and more delicious. Just because you’ve seen one sheet of seaweed doesn’t mean you’ve seen them all. The Cadillac of local brands is Saga Nori Ariake-Kai Ichiban. The prefecture and the local fishing cooperatives choose no more than three sheets out of every 10,000 processed for this particular brand. Their asking price is 100 yen ($US 0.95) a sheet. Now keep all that in mind as you read this article on nori the New York Times ran in their Dining and Wine section two weeks ago. It’s worth a glance for two reasons. First, it provides examples of how Western chefs creatively utilize nori as an ingredient to produce dishes unlike any served in Japan. Second, the tone and content of the prose are so pretentious they turn the piece into unintentional comedy. In the West Village, Evan Rich whirs through 300 sheets of nori a week at Sumile Sushi — not counting what the restaurant’s sushi chef, Toshio Oguma, uses for maki — blending it with apples simmered in cider for a riff on pork chops with applesauce. Arnaud Berthelier, at the Dining Room at the Ritz-Carlton, Buckhead, in Atlanta, has stirred nori into black truffle-flecked risotto since discovering how well its iodine flavor goes with the earthiness of the truffle. Ken Oringer, chef at Clio in Boston, sees it as a perfect opportunity to take diners out of their comfort zone…So he showcases nori’s distinctive crispness with a barely sweet caramel-nori croquant bent into a tubular shape and filled with sea urchin and a foam of wasabi and green apple. Befitting a chef who orchestrates $400-a-head meals, Mr. Takayama even toasts it himself, something few chefs do. In his prep kitchen he waves the translucent, brownish-red sheets of untoasted nori over a steel disk set on a burner, letting them graze the surface until they turn the familiar dark green. In other words, the chef to society’s upper crust “orchestrates $400-a-head meals” by doing something that every Japanese housewife does regularly in the home to make a quick snack. Those tubular shaped caramel-nori croquants filled with a foam of wasabi and green apple will surely come to mind the next time my wife sends me to the shop down the street for some lettuce and tuna maki! Matsuri da! (67) Here come the kasedori! WHAT WOULD YOU IMAGINE if you were walking down the street and came upon a scene of people throwing confetti on the creatures shown in the photograph? If you guessed that it was a promotion for the Kasedori Festival to be held on 11 February in the city of Kaminoyama, you’re either very lucky or know a lot about what happens in Yamagata! 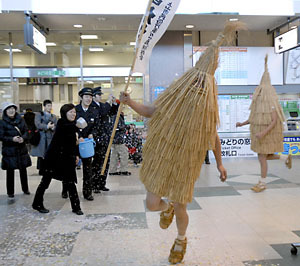 Five of Kaminoyama’s famed kasedori appeared at the JR Yamagata station on Sunday to get people excited about next month’s event. Judging from the expressions on their faces, it seems to have worked! Those straw coats they’re wearing are called kendai. A helpful website with details on the festival explains that those handmade coats are light and scratchy when new, but get heavier and more comfortable with age. The kasedori jumped around and made odd bird noises while the onlookers showered them with confetti instead of the water they will be drenched with next month. Originally a fire prevention festival that dates from the mid-17th century, the Kasedori died out in 1896 and then was brought back to life in 1956. It is now held in supplication for prosperity in commerce and household safety, as well as for fire prevention. You too can train to be a kasedori! It’s easy and fun, according to the website. And be sure to take a look at the photos while you’re there! THE WORLD IS WELL AWARE that the Chinese are choking on the polluted fumes they spew daily into the atmosphere, and that the noxious gases they export with their manufactured goods are causing serious health problems, particularly for their neighbors. Now, reader S.B. sends along this article from the International Herald Tribune, which explains the Chinese have developed a large fish farming industry that has created water pollution problems so severe as to prevent consumers in other countries from eating the exported fish. The boom did more than create jobs. It made China the only country that produces more seafood from fish farms than from the sea. It also helped feed an increasingly prosperous population, a longstanding challenge in China. Importers of Chinese seafood quickly caught on. In recent years, eel shipments to Europe, Japan and the United States have been turned back or destroyed because of residues of banned veterinary drugs. Eel shipments to Japan have dropped 50 percent through August of this year. Do I need to tell you that some Chinese in the industry have found a way to be critical of Japanese behavior? Some growers have lashed out at Japan, arguing that it keeps raising the drug residue standard simply to protect its own eel farms against competition. Japan has been developing the new regulations for more than three years…The new Japanese regulations are based on international standards established by the United Nations’ Food and Agriculture Organization and the World Health Organization to ensure food safety. The same source notes that the American pork industry changed its behavior to protect its livelihood, and used the example of the Japanese ban on American beef as a cautionary tale. Besides, Japanese domestic production of eel, beef, and pork is insufficient to satisfy domestic demand. The new criteria involve 302 food products, 799 agricultural chemicals and 54,782 inspection criteria and is (sic) believed to be the world’s strictest by far. A ministry spokesperson has promised the ministry would follow Japan’s new criteria strictly so as to guide Chinese exporters. Since 2001, says the ministry, China has suffered 24 major trade and technical barriers hindering its exports of farm produce to Japan. China has resumed exports of grilled eels to Japan after a four-month suspension triggered by reports saying banned drugs had been found in the products. Inspection and quarantine authorities in southern China’s Guangdong Province, the country’s leading eel exporter, said exports to Japan resumed in mid November…Chinese grilled eel products were taken off Japanese shelves in July amid concerns about the use of antibiotics and some banned substances, said Huang Weiming, Guangdong inspection and quarantine bureau vice director. He said Guangdong had not received a single order for grilled eel from Japanese importers over the past four months. Many Japanese love grilled eels from China. They make up about 80 percent of the market and are sold at prices 40 percent cheaper than similar Japanese products, Huang said. Here’s how the first sentence should read: Many Japanese love the price of grilled eels from China. “Our market will expand in Russia and Southeast Asia, and the EU,” Wang said. The European Union said Friday that it will follow the lead of the U.S. Food and Drug Administration, which said it is stepping up scrutiny of Chinese farm-raised seafood. I wouldn’t bet the fish farm on it. ONE OF THE MOST IMPORTANT ELEMENTS of Shinto, and therefore of the traditional Japanese way of life, is the emphasis on purity and cleanliness. That emphasis is immediately apparent when visiting any Japanese bath and observing how people conduct themselves. 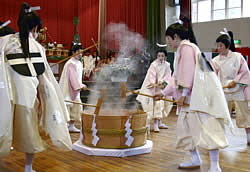 Participation in Shinto events requires the same purification; Shinto priests must bathe thoroughly before conducting any festivals in a practice called kessai. 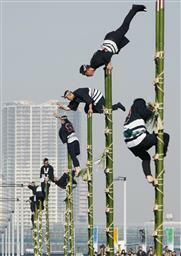 This misogi is held at the Kanda Myojin, a Shinto shrine in Tokyo founded roughly 1,270 years ago. 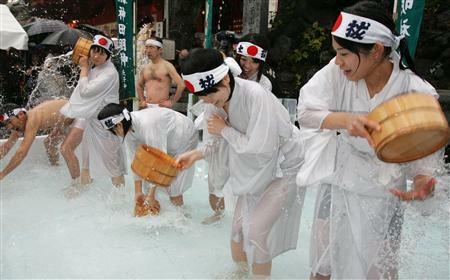 They’re taking a midwinter bath in a special tub outside the shrine as part of the Daikoku Festival. One of the participants, a 20-year-old college student, reported that she was cold during the preparatory exercises—they did exercises first?—but didn’t feel anything when she was in the water bathing. She was probably too numb by that point! Participating in this festival seems as if it would be a classic trade-off. On the one hand, getting in the water and splashing around with the ladies would surely be a lot of fun. Cleanliness is next to godliness, after all. On the other hand, it involves stripping down to a loincloth and taking a cold bath outdoors in the middle of January. Ah, but let’s not forget it’s a misogi! It’s a religious experience that will drive away evil spirits and purify the bather. That tips the balance for me! Japan’s economy no longer “first class”? JUST AS THE JAPANESE ECONOMY seemed to be waking from a nearly 20-year coma as if it were a Far Eastern Rip Van Winkle comes some discouraging words from Ota Hiroko, the Minister of State for Economic and Fiscal Policy. Delivering the government’s economic address at the start of the new Diet session (roughly an economic state of the union speech), Ms. Ota said the Japanese economy could no longer be termed “first class” despite the ongoing expansion, the country’s longest in the postwar period. She cited as one reason for her assessment the fall in the country’s per capita gross domestic product to 18th among the 30 member nations of the Organization for Economic Cooperation and Development in 2006, the sixth straight annual decline. She said the country had been left behind by the dynamic changes in the global economy, and that it had not formulated a framework for continued growth. Ms. Ota also noted that Japan’s share of aggregate world income had fallen below 10% for the first time in 24 years. This address provides the backdrop for what many observers think will be the most contentious issue of the current Diet session, the government’s proposal to renew a temporary surtax on fuel. The debate in the Diet between the government and the opposition has shifted from the renewal of one gas station law to another. During the extraordinary session of the legislature just ended, the Diet passed a bill resuming the Japanese contribution to NATO’s military efforts in Afghanistan by refueling their vessels in the Indian Ocean. MPs will now discuss the renewal of a tax that will determine just how much drivers will pay at the pump when they refuel their cars—and gasoline prices have soared here as they have everywhere else. The temporary surtax was levied in 1974, nominally for just two years, to cover a shortfall in the revenue needed to pay for a five-year plan for road construction that had been implemented the year before. Japan in those days was still very much in the Era of Rapid Growth mode. But politicians everywhere are loath to abandon cash cows, so it’s no surprise that successive governments kept renewing the tax for more than 30 years (though its Japanese name still contains the word “temporary”). The legislation authorizing the tax will expire at the end of March, which is the end of the Japanese fiscal year. The ruling Liberal Democratic Party wants to keep the tax alive, while the primary opposition group, the Democratic Party of Japan, wants to kill it. The basic tax on gasoline is fixed at 24.3 yen per liter by law, and the temporary tax doubles that. Gasoline (in my neighborhood) sells for about 145 yen per liter, or roughly $US 5.10 per American gallon, so the levy is both a substantial revenue source and a burden on business and the consumer. The LDP argues the measure will serve as a de facto carbon tax and help the country cut carbon emissions by reducing gasoline consumption. Meanwhile, the DPJ claims the tax hurts people with lower incomes. Of course there’s more to it than that. Since the tax revenue is used for road construction, extending the tax will keep the spigot open for public works projects, delighting the large construction companies. Construction industry support for the LDP over the years is one reason the party has dominated Japanese politics for so long. Another group typical of those supporting the continuation of the “temporary tax” is an association in Kyushu formed to promote the construction of the Kyushu leg of the Shinkansen high-speed railway, now partially open and scheduled for full completion in three more years. The association’s members are not just business interests; the governors of the four prefectures through which the main route will pass are also involved and strongly support the tax measure. Their primary concern is how they’ll be able to afford the infrastructural improvements needed in conjunction with the Shinkansen, such as access roads. 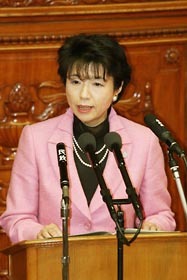 And the governors of the eastern Kyushu prefectures, where the Shinkansen will not run, are anxious to see the tax retained because they were mollified with the promise of a major expressway construction project after they complained that the western part of the island was getting all the pigmeat with the Shinkansen extension. Finding themselves in the same boat, but on dry land, are the small independent farmers who also require fuel to operate their equipment, and who, like the large construction companies, also turned their back on the LDP in last year’s upper house election to switch to the opposition for similar reasons. Finally, smaller construction companies are clamoring for cheaper gas even though they realize it will mean a commensurate decline in public works projects. The owner of a small construction company in Nagasaki told the same reporter that conditions have become so bad that several companies in his area have sold some of their vehicles. Both sides make valid arguments, and the resolution of the matter will benefit some at the expense of others, as well as influence trends in the no-longer-first-class economy. Because this issue is more likely than the Indian Ocean refueling issue to have a direct impact on the lower house election many observers expect to be called later this year, public opinion could be the decisive factor for resolving the debate. That would certainly be a new development for Japanese politics. On the one hand, the business-friendly, right-of-center LDP is behaving as if it were the Green Party when it talks up the merits of the tax, while the left-of-center, labor union-backed DPJ finds itself supporting a measure that will primarily benefit small businessmen, farmers, and fishermen in the private sector in addition to the general consumer. Perhaps that’s what they mean when they say politics makes strange bedfellows. SOME PEOPLE SMOKE HEMP to get kaleidoscopic visions in their head. At the Itakiso Shinto shrine in Takayama, Gifu, parishioners cook hemp stalks in rice gruel to get prophetic visions of the year ahead. Maybe THC has some properties that modern science hasn’t discovered yet. The Kudagai ceremony is conducted at the shrine every year on 14 January. Four young men cut the hemp stalks into six-centimeter-long pieces with diagonal slices on the end. The stalks are placed in kayu, or rice gruel, along with soybeans and azuki beans, and boiled. After the mixture has fully cooked, the hemp stalks are removed and cut open. 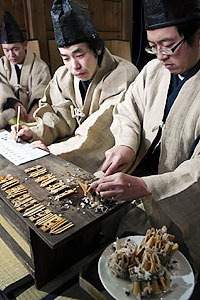 The four parishioners—who dress in kimono made of hemp for the ceremony—scrutinize the amount and the condition of the grains inside the hollow stalks and render that in drawings on pieces of paper. They use these drawings to divine events in the upcoming year. It is considered to be a particularly favorable omen when a large amount of azuki beans is found inside the stalks. There are no reports, however, on what other criteria they use to make their determinations. This year, the participants put together predictions for about 100 different subjects ranging from the weather and the crops to the results of the Beijing Olympics. According to their forecasts, the weather next winter will be typical, except Takayama residents should expect more snow than usual. They’re not very high on the harvest in the coming year, but the wild mountain vegetables should be plentiful. And Japanese athletes have a chance in the marathon, softball, and wrestling competitions during the Olympics. I’ve heard about people getting loaded and giving tarot or I Ching readings, but putting out prophecies for agriculture and sporting events is a new one on me. The Kudagai ceremony has been conducted for more than 600 years. The story goes that it was originally used to determine the amount and types of grain to be planted in the spring. When they’re finished with the predictions, the four men eat the mixture and drink sacred sake, which is supposed to prevent illness in the year ahead. They probably won’t feel any pain for the foreseeable future either! People come up with some remarkable ideas when they’re down to stems and seeds again! WHILE VIEWING THE KOREA TIMES WEBSITE when preparing the previous post, I stumbled across this op-ed called Some Foreigners Bash Korea Unjustly, Unfairly, written by an English teacher there. Substitute Japan for Korea, and the same article could have been published in any of the English-language dailies in this country. Heck, I could have written it. It’s curious; I’ve talked to a lot of Asians here, from countries as far away as India, Sri Lanka, and Malaysia, and I’ve never heard a negative comment about Japan from any of them. Meanwhile, snide Japan sniping, couched in the fashionable irony that passes for wit and repartee in some countries, is as common a conversational topic for many Westerners as the weather. One has to wonder when the same sort of people are saying the same sorts of things in South Korea. Some people–again, mostly Westerners–think McDonald’s, Coca-Cola, and popular music are symbols of cultural imperialism. That’s silly, of course. Those are just consumer goods purchased freely by people with other choices for spending their disposable income. The real cultural imperialism is the attitude. HERE’S ANOTHER POST inspired by something a reader sent in: I received an e-mail from C.B. sending along a link to an article he read in the Korea Times called First Sunrise by the East Sea. By the East Sea, the author is referring to what the rest of the world knows as the Sea of Japan. No dispute has erupted between Korean and Japan. The Koreans keep complaining, the Japanese keep objecting, and international bodies maintain the status quo. As I reported in this post, the international conference on geographical name standardization stuck with the Sea of Japan, and they won’t take it up again until the next conference in 2012. The anthem has so much symbolic importance there were several versions of the lyrics until 1907, and it was sung by most Koreans to the tune of Auld Lang Syne until 1948. Furthermore, the sea area is shared by four countries: Korea, North Korea, Japan, and Russia, consisting of territorial waters and Exclusive Economic Zones (EEZ) of each country. It is, therefore, inappropriate to name this area after one particular country when several countries share sovereignty and jurisdiction. Now that you mention it, do you have any suggestions for renaming the Gulf of Mexico, the Indian Ocean, and the English Channel? Why are there no complaints that the East China Sea isn’t named the West Sea? Or is that just too much chutzpah, even for a Choson nationalist? It is against this backdrop that Korea is asking the international community to use “East Sea” and “Sea of Japan” simultaneously as the international standardization rules require, until the issue is settled in an amicable manner. Or until, in what is more likely your strategy, you browbeat the rest of the world into giving in just to make you shut up and go away. UPDATE: Reader Aceface wonders about the Northeast Asian History Foundation, because the author of the piece is identified as an “ambassador” there. Well, ask and ye shall receive! The Northeast Asia History Foundation, officially initiated on September 28, is…expected to play a significant role in efficiently coping with China’s recent claims over Korea’s ancient history and Japan’s repeated attempts to whitewash its past wrongdoings and its claims over the ownership of Dokdo Islet…. (T)he academic foundation was established to systematically respond to those historical fabrications. Well now, didn’t that cause your eyebrows to rise? I guess it’s easy to wax poetic about the sun rising over the East Sea when one is a paid employee of a quasi-governmental propaganda agency. Here’s their website. While the article focuses more on China than Japan, the foundation’s website states their key programs include international exchange based on peace, strengthening their claim on Dokdo (Takeshima), developing strategies to deal with Japan’s “shift to the right”, seeking international support for the names of the East Sea and Dokdo, and “providing logical responses to history related controversies”. Good luck with the first and last one if they insist on the middle three. Their mission statement claims they aim to achieve peace and prosperity in Northeast Asia by confronting distortions of history. And people think I’m a lobbyist!